Some of the questions we have for hybrid technology are now dependability in cold weather starting, reliability in highway driving standards, added to these ever so alluring fuel cost savings. If you want to have a renewable energy system you need to learn to conserve well in advance of buying the system. No More Coals To Newcastle! The concept of using biodiesel may seem a new one, but it is not. Rudolph Diesel's first engine ran on peanut oil and now, a century later, it seems we are finally learning that natural oils are better for our health , our environment and ultimately our economy than fossil alternatives. Starting with an anonymous donation and some bright ideas from a design consultant, combined with the ambition and organization of parish staff, and the helping hands of 17 women and an environmental business; this system is truly a symbol of what collaborative team effort can do for sustainable development. As a professional, technical, and scientific service provider, ESA connects the best products, services and knowledge from the environmental industry to businesses and communities nationwide. Simply put, HALT is superior to conventional testing because it is cost effective, faster, more accurate, compresses our product time to market, and maximizes customer satisfaction. Apart from the small electronic component the whole installation can be made locally with materials available in nearly every part of the world, being glass and PVC piping and appendages. Inverters convert the "DC" electrical power output of renewable energy technologies - such as solar, wind and fuel cells - to the high quality "AC" that our conventional power system require. The Baumgartner's not only enjoy modern appliances, they also have lower fuel bills and enjoy power even when their neighbors are suffering from a blackout. The only evidence that their house is running on solar power is the noise from the generator when it is running. The PV market is approximately $3.5 billion worldwide today, and is expected to grow to over $20 billion by 2012 to 2015. The rate of growth of PV products has increased by 25 percent annually over the last 5 years and is expected to continue at this rate or greater for the next few decades. The small hybrid solar and wind energy system at NREL's Outdoor Test Facility produces 1,400 watts of power from solar and 900 watts from the wind turbine, enough to power a refrigerator, lights, heaters, air coolers, computers and a radio. The fuel of the future, according to many, is hydrogen. And recent announcements from California to Canada suggest the West coast will be the first to embrace this vision. With a full range of capacity options (85AH-3300AH) and voltage configurations to choose from, Rolls Battery maintenance-free 2V, 6V & 12V AGM and broad range of 2V GEL models offer a valve regulated lead acid (VRLA) battery option with the same dependable energy storage and heavy-duty construction customers have grown to expect from the Rolls brand for over sixty years. Installed in off-grid, grid-tied or backup float applications, these sealed batteries require minimal ongoing maintenance and provide a versatile energy storage solution for remote or confined installations. 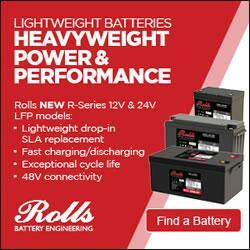 Rolls Battery AGM and GEL battery lines deliver superior cycle life and are backed by an industry-leading warranty.